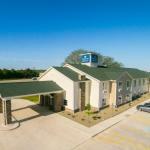 Offering a free hot breakfast Cobblestone Inn & Suites is located in Corry. Free WiFi access is available. A microwave refrigerator and flat-screen cable TV are included in each guest room. The private bathrooms are equipped with a hairdryer and free toiletries. A mini-market is located on-site at the Corry Cobblestone Inn & Suites. There is also a shared lounge and a 24-hour front desk. The property offers free on-site parking. Corry Country Club is 4 minutesâ?? drive away. Erie is 54.6 km away.